In the Fall of 2018 Amazon completed its yearlong competitive search of more than 200 cities to find a second U.S. headquarters. The final result was that there would be two second headquarters because Amazon could not find any one location in the U.S. with enough qualified technical talent to meet their needs – a sorry enough story in & of itself. Long Island City in Queens NY & the Crystal City neighborhood of Arlington, VA were Amazon's preferred locations with each city expected to realize an increase of 25,000 high paying jobs as the total $5 billion Amazon investment in the two locations progressed. The plan was for Amazon to build @ least four million square feet of office space @ each location. In order to secure their half of the HQ2 project NY state & NYC offered up to $3 billion combined total in pot sweetening incentives to Amazon in one form of subsidy or another. For their part Virginia kicked in a substantial amount but quite a bit less than NY: $573 million in cash grants & infrastructure improvements. NY Governor Andrew Cuomo & NYC Mayor Bill de Blasio could not have been more excited about the prospects of the Amazon HQ2 project. 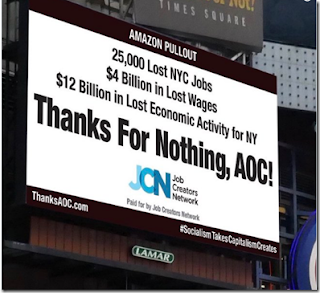 But socialist Congresswoman Alexandria Ocasio-Cortez (AOC), whose congressional district #14 includes the eastern part of the Bronx & portions of north-central Queens, but not Long Island City where the HQ2 project was to be located, considered the deal one of the biggest giveaways in state history & thought that Amazon was taking advantage of the governor's & mayor's eagerness to spend other people's money saying that the $3 billion could be put to better use for middle class people currently living in NYC rather than $150,000 per year computer scientists brought in from who knows where in the future. On February 14 Amazon cancelled its plan to build HQ2 in NYC. I received a very discerning comment from a subscriber that pointed out that NYC has a tremendous advantage in large "people talent, services, & infrastructure" over just about every place that competed for HQ2 except DC. If not for that advantage Amazon "would have gone to Podunk town in Rural America & forgot NYC & DC with their big city problems." But Cuomo & de Blasio did not trust the intelligentsia, education, or sophistication of the legal residents of NYC enough to think Amazon would not go to Podunk without the pot sweetening incentives the state & city offered. Both men wanted HQ2 & that is why they offered the $3 billion in incentives to attract Amazon. In this regard socialist AOC has more faith in her fellow New Yorkers than the longtime establishment Democrats do. 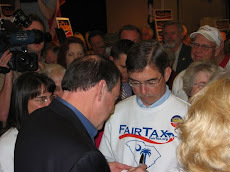 The above point became evident when Cuomo admitted "that high costs & taxes in NY contributed to the Empire State's package (to Amazon) being more generous than Virginia's" or dare I say Podunk's. In fact NY politicians spent $10 billion last year – more than any other state – on business incentives. 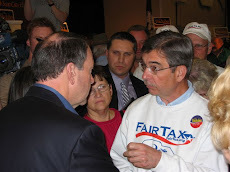 Governor Cuomo has been a vociferous opponent of the Tax Cuts & Jobs Act ever since it was signed into law on December 22, 2017 mostly because NY has the highest state & local tax (SALT) deduction & the new income tax law limits the federal SALT deduction to $10,000, meaning those New Yorkers who pay very high state & local taxes to NY are still paying that same amount but now are paying more federal taxes because of the limited SALT deduction. Cuomo has blamed the SALT deduction cap for the state's revenue decline that produced NY's $2.3 billion budget shortfall & has called it the driving force for high income people leaving the state for places like Florida which, unlike NY, does not have an estate tax. 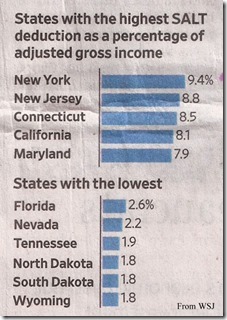 See table below for comparison of states with the highest & lowest SALT deductions. Cuomo says that someone in the highest income tax bracket living in NYC paid a combined federal-state-city income tax rate of 45% prior to the 2017 income tax law overhaul & that the rate increased to 50.4% in 2018 because of the changes to the SALT deduction. Wealthy taxpayers in the high SALT deduction states in the above table have been using the SALT deduction for decades to lower their federal income tax bills which makes a bad, read high or expensive, state & local tax burden more tolerable. The Tax Cuts & Jobs Act of 2017 gives taxpayers of high SALT deduction states a much better chance to do something about high taxes other than complain or deduct them on their federal income tax returns. SALT deductions on federal income tax returns have been one of the largest tax breaks that Democrat controlled states like NY have benefitted from for decades. It is not the new income tax law that is driving people out of NY but the combination of the limitation of the SALT deduction & the high taxes & cost of living in NY state & city. It is the profligate state & local government spending that must be brought under control - not just in NY but also NJ, CT, MD, CA et al. that is subsidized by all the other states who do not have large state & local taxes. 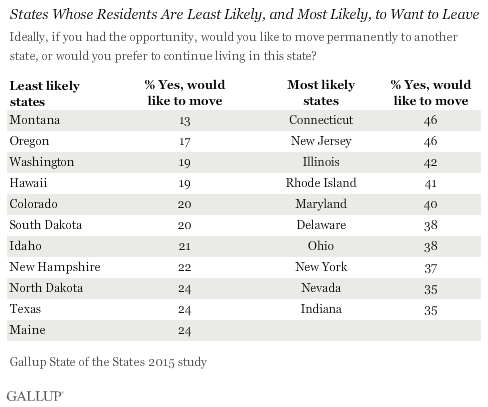 The following Gallup study table shows that the state tax burden is linked to people's desire to leave their state. This study also reveals what Cuomo & de Blasio knew about Amazon – that people would be reluctant to come to NY with its high taxes & cost of living. the more prices go up. Should be able to see putting these two wires together a light bulb would go off. Instead of putting on sunglasses the light is blinding yet no one can see. Yes Cuomo & de Blasio were in the dark in calculating what it would take Amazon not to locate in some obscure or rural region. That is because as career politicians living in ivory towers (and one Actually a Communist) they are not even close to Judge the economic and business advantages of NY metro talent. A more modest incentive to Amazon May not have irked Cortez to point of #1 catalyst to drive out Amazon. End result is very negative for NY metro. Smart company execs and workers in NY metro know the Pro Left env ironment will result in decreasing role of tech talent and jobs in NY metro. Expect more companies and smart tech workers and students accelerate their emigration to Texas and Florida.